I am totally in love with garden stools, if it wasn't for the price I would put them everywhere. Living room, office, on the deck and they come in so many colours. I am searching for a decently priced stool, so if you see one let me know. I love this tank! Perfect for Valentines day, and just super cute. And the price, $14 I really should buy this before it is too late. There is no possible way I will ever be able to own this, but a girl can dream! With two dogs constantly "digging" in the covers I am sure this would rip immediately. Either way I love the style. I love, love, love this rug. I have no idea where I would put it though. It's on sale so I probably pick it up now rather than later. Maybe it could go under the sink cabinet like in Rhi from Hey Gorgeous Events home tour? Hello! Thank you for stopping by. 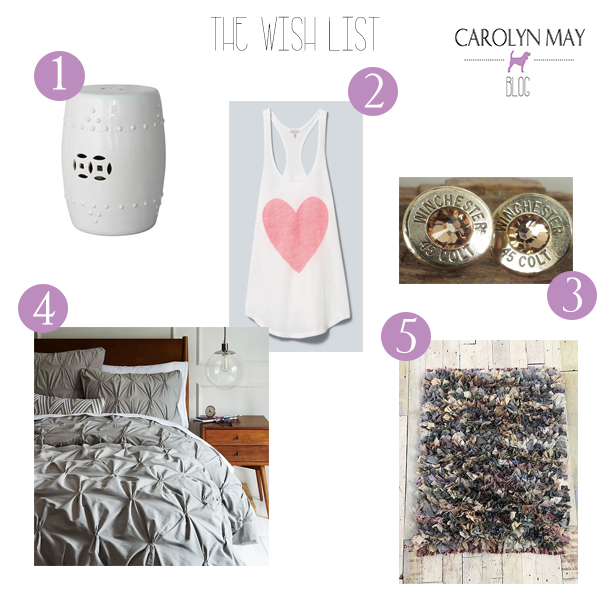 My name is Carolyn, the heart and soul behind Carolyn May Blog. Living in the beautiful Okanagan Valley, of BC Canada, I am just trying to squeeze all of life in. Constantly busy renovating our house, pursing careers, eating well, keeping up with our two dogs and just trying to get the most out of life. Again, thank you for taking the time to stop by. Please feel free to leave a comment, I would LOVE to hear from you!